Yurzul Dhanani, M.D., Hemet | Advanced Sleep Medicine Services, Inc.
Dr. Yurzul Dhanani is Board Certified in Internal Medicine, Pulmonary (Respiratory) Medicine and Critical Care Medicine. 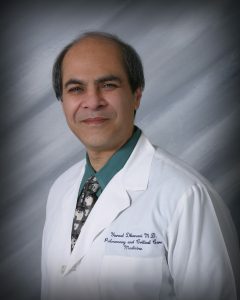 Dr. Dhanani specializes in the diagnosis and treatment of sleep disorders, in particular sleep apnea, and lung diseases. Dr Dhanani did his Internal Medicine Residency at Helene Fuld Medical Center in Trenton N.J. and completed his Chief Residency at the same institute in 1984. Dr. Dhanani completed his Fellowship in Pulmonary and Critical Care at the University of California, Irvine Medical Center in 1986.